Canter’s is open 24 hours a day, seven days a week, and on all holidays except Rosh Hashanah and Yom Kippur. Planning a party for two... or two hundred? Try 'Canter’s Catering Service' for the city’s best sandwich, meat, and fish platters, fresh salads and delicious bakery trays. Our bakery offers special cakes for Weddings, Bar/Bat Mitzvahs, Birthdays, Brises, or any other special event. Browse our catering menu then call 323-651-2030 to place an order or email us at CantersDeli@gmail.com. Yes, we take reservations for large parties. Call 323-651-2030 and our staff will be happy to assist you. Canter’s Shop is now online! We sell our World Famous Chocolate Chip Rugula by the pound, as well as T-shirts, Sweatshirts, Hoodies, Hats and Gift Certificates. Shop Canter’s at www.CantersDeliShop.com. Since 1931 we have been known for great deli food! We strive to provide delicious and diversified comforting meals, top-quality baked goods and delightful take-out and catering. As inviting as our food, we are also known for our welcoming ambience, a perfect blend of contemporary comfort with the nostalgic charm of our 1950’s decor. We have been home to late-night Hollywood for generations. Family-owned for more than 80 years, we are lovingly managed by the third- and fourth-generation of our family. Similarly our LA landmark is frequented by second-, third-, fourth- and even fifth-generation customers that include people from all walks of life, including actors, athletes, producers, writers, directors, politicians, musicians and our most important customer, you. Over the years we have been honored to receive numerous awards in Southern California. These include: “Best of LA’s HOTLIST Contest,” “Los Angeles Times Readers’ Choice Award” and voted best pastrami by the LA Times and LA Weekly. Additionally, many of our menu items have received nationwide recognition as being the best in America. Our endless achievements and accomplishments have been documented in countless articles written about our establishment over the years - articles which reflect our 80 plus years of business in Los Angeles - and our dedication to providing high quality food in the comfort of our welcoming ambience. Our Kibitz Room full-service bar and lounge has been a local scene since it opened adjacent to our restaurant in1961. We are open from 10:30AM to 1:40AM with daily “Happy Hours” from 4:00PM ‘til 7:00PM. Every evening music fills the Kibitz Room’s walls with local bands - most nights turning into jam sessions by midnight. Open mic night is every Sunday from 9:00PM until 11:30PM. (No reservations required.) To learn more about the history of our Kibitz Room Bar and Lounge and the legendary singers and bands that have played on our stage click here. I'm a vegetarian! 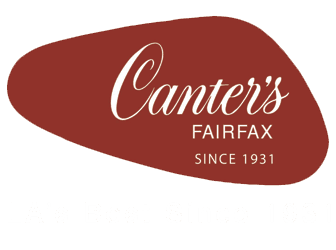 What can I eat at Canter’s? At Canter’s we pride ourself on carrying a variety of vegan and vegetarian options. We offer a vegetarian vegetable soup, a veggie burger, a veggie reuben sandwich, a veggie pesto panini melt, and many mouth watering salads to choose from. Additionally, many items can be prepared without meat. No, we are not Kosher. When teenager and amateur photographer Marc Canter, grandson of founders Ben and Jennie Canter, set out to document his best friend Saul Hudson's rise as a rock guitarist in 1982, he never imagined he was documenting the genesis of the next great rock 'n' roll band. His friend became the legendary guitarist Slash, and Marc Canter found himself witnessing the creation of Guns N' Roses front and center. He documented their rise to stardom from the very beginning. Signed copies of “Reckless Road” are available at Canter’s. To buy Marc Canter's book visit his store. Canter’s first licensee opened at Treasure Island Hotel and Casino in Las Vegas, Nevada in early 2003. This 130-seat modern version of Canter’s was located adjacent to Treasure Island’s race and sports book. After an exciting 10 years at Treasure Island - serving a large selection of our signature Canter’s Deli Fairfax items - we closed in December 2012 to make room for their newly expanded Poker Room. The Canter's Delicatessen stand at Dodger Stadium was located on the field level by the third base line for 3 seasons from 2008 - 2010, during the three legendary years when Joe Torre was manager. We were thrilled to debut our kosher-style hot dog in the 2009 season and it was served only at Canter's.